I wrote this poem at the beginning of the year in a time of drought. My partner and I had separated, and I felt my own parched barrenness mirrored the landscape. Like a fertile land in drought. Grass crisped beneath her feet. As she lay cushioned on soft grass. A longing, evaporated in the heat of the day. A familiar stranger appeared out of the blue. She felt different around him; charged. Roiled in his wake: electricity. And evaporating in trails of steam. Yet it seemed to only stoke his longing. He needed her fire like she needed the rain. The sacred water-hole which never ran dry. She sank beneath the silken water, deep and clear. Flowing into her like love. And she sighed in its silken caress. Previous Perfection and 40 days of meditation. Next Because I’m the Mum. Congratulations for being recognized for creating a wonderful poem! That also looks like a fun trophy to have won! Congratulations 🙂 Great poem. Fabulous imagery. Beautiful, Sara! Such an elegant, sensual, heartfelt poem. You certainly deserve that wonderful trophy. Woot, woot! 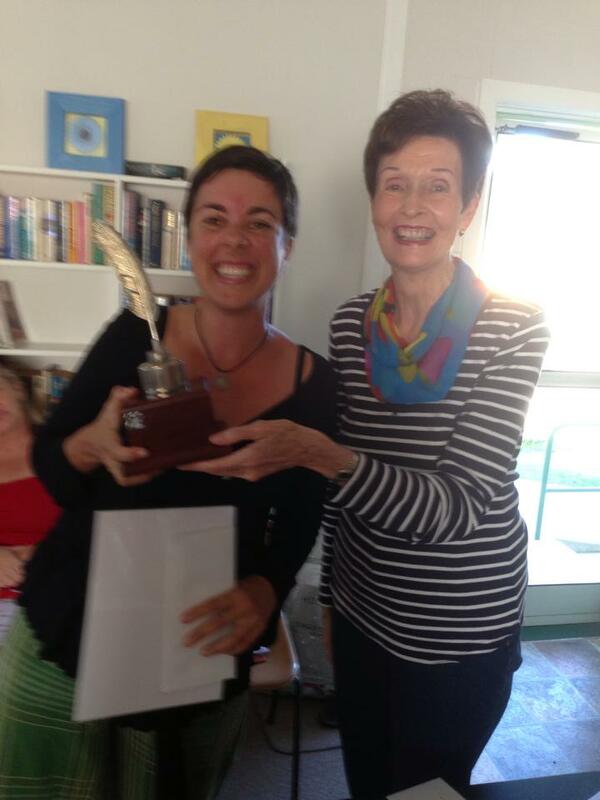 You rock… so does your poem… and your trophy… and your huge smile! Such an incredible moment! I’m so happy for you, Sara!